Have a 1949 wheat penny and want to know how much it’s worth? Most circulated 1949 pennies are worth 3 or 4 cents. Uncirculated 1949 pennies are generally worth $1 or more. Other 1949 Lincoln cents with errors are worth $100 or more. Some rare 1949 wheat penny values soar beyond $1,000 apiece! How Much Is A 1949 Wheat Penny Worth? Well… if you found your 1949 penny in pocket change, then it has some degree of wear on it. Most 1949 pennies are worth 3 or 4 cents. Very well worn 1949 wheat pennies are worth 3 to 10 cents each. 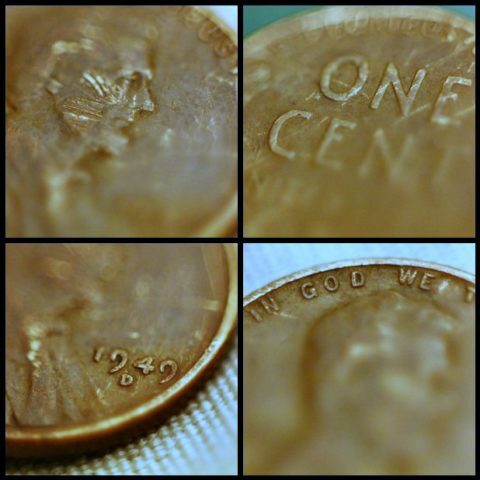 For a 1949 wheat penny to be worth any significant money, it needs to be uncirculated. The most valuable 1949 penny sold was a Mint State-67 with original red copper color that commanded a whopping $12,075 in 2006. The bottom line is your 1949 penny value depends on how much wear it has experienced and if it has any unique markings or errors. How Many 1949 Pennies Were Made? More than 400 million 1949 wheat pennies were made! To put that figure into perspective, that would have provided each American at the time with about 3 new pennies. Even today, 400 million pennies would be more than enough to reach every American! There were no proof 1949 pennies made. At the time, the United States Mint had focused its efforts on producing circulating coinage and striking medals for military personnel who served in World War II. Proof coinage resumed at the Philadelphia Mint in 1950. Are There Any Rare 1949 Pennies? Because the 1949 penny was struck in such large numbers, none of the regular-issue pieces are rare due to their mintage alone. However, all 1949 pennies become conditional rarities in very high uncirculated grades. That means so few exist in really nice condition — so they are rare because they’re in such good shape. While none of the 1949 penny errors or die varieties are very popular among most coin collectors, they are nevertheless worthy of pursuing –because they are unusual pieces that are, in many cases, quite scarce. What Else Happened When Your 1949 Penny Was Made? After the Soviet Blockade cut West Berlin off from the rest of Western Europe, the United States began airlifts to deliver food and other supplies to residents stuck behind on the Soviet side — becoming one of the first major incidents of the Cold War. Chinese communist revolution leader Mae Tse-tung proclaimed China the People’s Republic of China. The first-ever non-stop circumnavigation around the world in a plane was completed when a Boeing B-50 Superfortress known as “The Lucky Lady II” (piloted by Captain James Gallagher with a crew of 14) made its historic 23,452-mile journey in 94 hours and 1 minute of travel time. The North Atlantic Treaty Organization, widely known as NATO, was established to create an allied defense for Europe against advances from the Soviet Union. Author George Orwell’s dystopian novel Nineteen-Eighty Four hit bookshelves. The book, considered one of the most popular works published during the 20th century, tells a bleak tale of a totalitarian future. RCA created an efficient system for broadcasting color television, although widespread use of color TV in households across the United States was still years into the future. The first Volkswagen Beetle was sold in the United States. Silly Putty hit the toy scene, 45 RPM records were first sold, and the Connecticut city of Milford became the first municipality in the United States with automatic street lights.